In collaboration with the Sudan DDR Commission and the Criminal Investigation Directorate (CID), BICC held a four-day training on arms marking and registration in Khartoum, Sudan. From 11-14 October twenty-five participants from the five states of Darfur took part in a training provided by two trainers of the Regional Center on Small Arms (RECSA). The trainees were officers from the CID and the Sudan DDR Commission in Darfur. The training was festively inaugurated by the representative of the Police Commissioner, General Hamid Mannan; the head of the CID, General Mohamed Saied Makawy; the representative of the Commissioner General of Sudan DDR Commission, General Abel Azzis; and the Deputy Ambassador of Germany to Sudan, Mr. Philipp Herzog. The first training day focused on the importance of arms marking and registration as part of a SALW control program. On the second day the trainers provided a hands on training on the RECSA software that can be used to register firearms and to create a database. All participants registered at least one weapon into the system, thereby creating a database of the group. The two remaining days focused on operating the marking machines, during which all the participants practiced with actual marking. 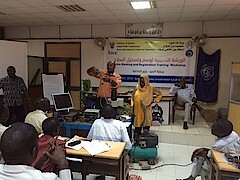 The arms marking and registration training took place as part of BICC’s capacity building programme on SALW control in Sudan, which is implemented in close cooperation with the Sudan DDR Commission. One of the main elements of this programme is to support an arms marking and registration programme in Thandelti, a community in West Darfur. BICC has been supporting arms control activities in Sudan and in particular in Darfur since 2012 on behalf of the German Foreign Office. The centre currently deploys a full-time international technical advisor as well as a consultant to the SDDRC.